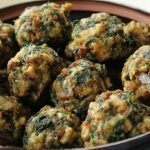 Spinach Stuffing Balls are a great make ahead side dish for your holiday dinner. Warm them up while the turkey is being carved then enjoy! Today I’m going to give you a ‘throwback recipe’…because it’s Thursday. Get it? I’ve been thinking about my early days as a mom recently, perhaps it’s because several of my friends are just starting to have babies or maybe it’s because my own children are no longer ‘little ones’. Back in the day, let’s say 20 years back, there was no Google. Any sort of parenting advice that I received came from my mother, books, or my network of mom friends. The same went for cooking. In my younger days as a university student mom our meals were simple. I sometimes relied on pre packaged ingredients. What can I say? As a cash strapped, naïve, ‘just off the farm’ young mom with little time to cook, packaged food was awfully convenient. We ate a lot of canned soup, zoodles, hot dogs, and mac ‘n’ cheese. I balanced our diets with a salad or fruit. I wasn’t completely clueless. On the weekends I had a bit more time to experiment and often made muffins, lasagna, and always a roast beef for dinner. 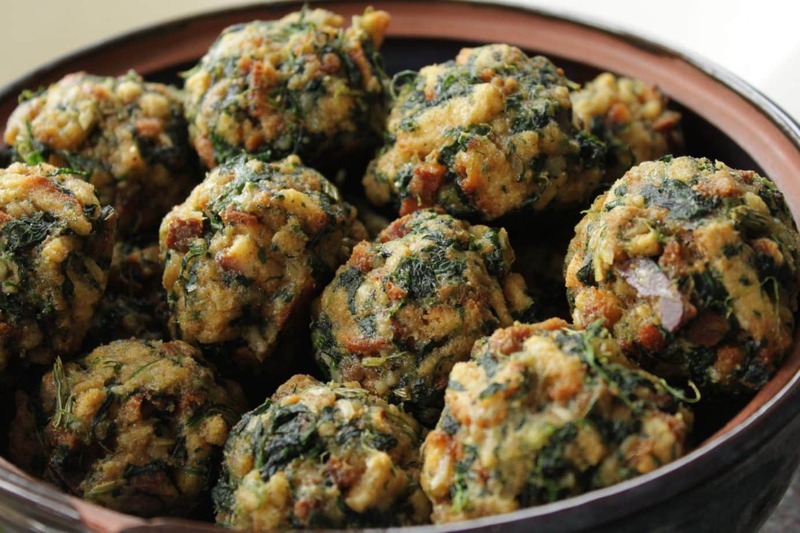 I remember looking for an easy side dish for a Thanksgiving feast one year. My parents were driving the two hours to visit us for a special meal in our tiny apartment in Saskatoon. I wanted something a bit different than the usual mashed potatoes, carrots, and stuffing to go with the turkey. Also, sneaking spinach into something yummy and hand held was an important part of my repertoire as the mom of a young toddler. I think I must have found this recipe on the side of the stuffing box, but I’m not quite sure. 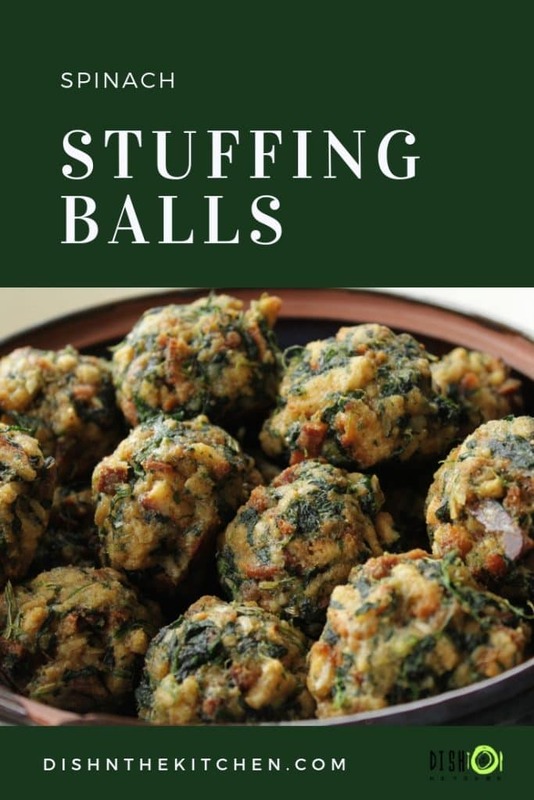 I made these stuffing balls again recently for a large family get together and my son’s fiancée begged to take the leftovers home. It’s been so long since I’ve made them I wasn’t sure if they were still relevant in our house in the present day, but they were still quite popular. The next time I make them I will play around a bit with the seasoning as I found them incredibly salty. I think that this is one of those dishes that can easily be converted by using quality whole food ingredients instead of pre-packaged nonsense. 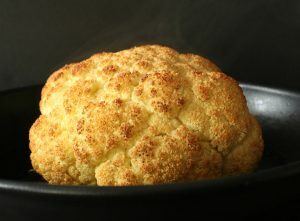 A great make ahead side dish for the big turkey dinner or any night really. 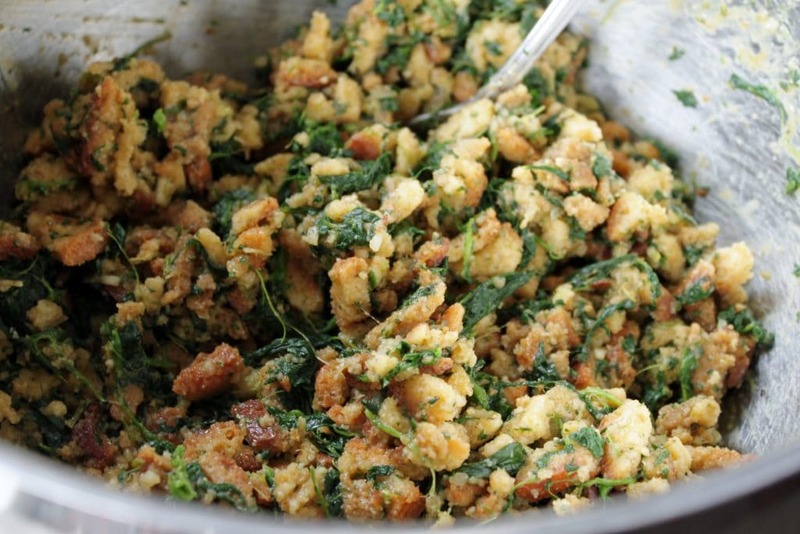 In a bowl, combine eggs, stuffing mix, butter, Parmesan cheese, salt and pepper. Shape into 1-1/2-in. 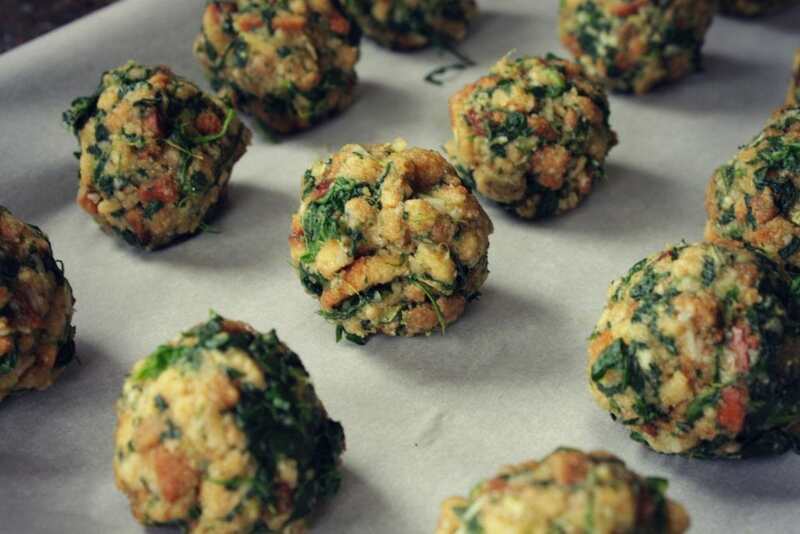 balls; place in an ungreased 15-in. x 10-in. x 1-in. baking pan. *You could use regular dried bread cubes here, but do use small cubes and not crumbs or torn dried bread. I think it works better for the texture and appeal. If you are using plain bread crumbs and not the stuffing mix, add regular spices as you would in your stuffing mix (Sage, rosemary, thyme, salt, pepper). These look great,,, I’ve never heard of them,,, pretty too! Thank you Darie. I like that you can make them ahead of time and they re heat really easy. I put them back in the oven while hubby was carving the turkey and they were perfect when he was finished. These really look good! 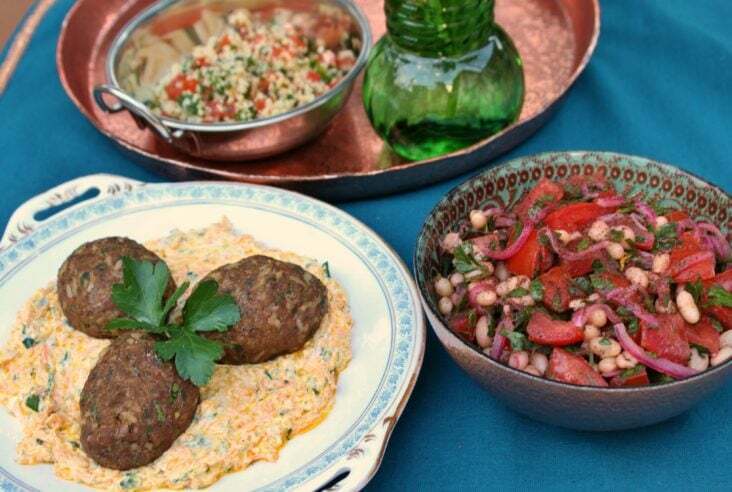 My husband was a vegetarian for years, so I got very creative making meatballs like these, meatloaf, and burgers, all with veggies and lots of beans! They were really good! thank you mimi! they are great and just need a little tweaking to make them healthier 🙂 It’s on ‘the list’.